Tomatoes grow well in hoophouses, but they need support and pruning, and no two farms are the same. 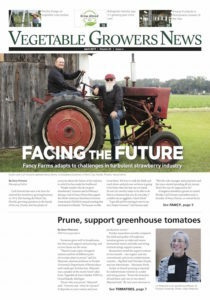 “There’re many types of support systems and lots of different parts of a tomato plant to prune,” said Liz Maynard, assistant professor in Purdue University’s Department of Horticulture and Landscape Architecture. Maynard was a speaker at the recent Great Lakes Fruit, Vegetable & Farm Market EXPO in Grand Rapids, Michigan. 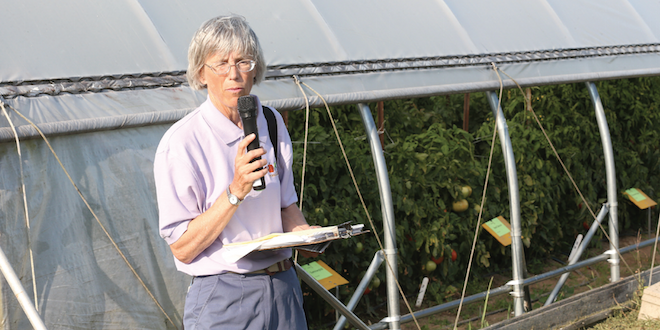 Purdue researchers recently compared the yield and quality of hoophouse tomatoes grown on stake and weave (horizontal weave) and stake and string (vertical string) support systems. Researchers tested the support systems in two tunnels – one organic and one conventional, and on two indeterminate varieties – Big Beef and Cherokee Purple, and one determinate – Mountain Fresh. Sucker or branch pruning is essential for indeterminate varieties in a stake and string system. “Prune the branches off and leave only one or two stems,” Maynard said. “Be sure your structure is strong enough to support all of that weight.” A small sucker can be broken off, but larger branches may need to be pruned. Pruning is less critical in a horizontal system. “You can grow an indeterminate variety in a stake and weave without pruning,” Maynard said. Semi-determinate or determinate varieties may also not need pruning – regardless of the support system. “The main stem terminates in a flower cluster and that limits the size of the plant,” Maynard said. Start at the base and move up if you do prune a semi-determinate or determinate variety, but don’t prune above the first flower cluster. “The amount of pruning has to be best determined on an individual system,” Maynard said. The stake and weave support system in Purdue’s study was unpruned. The suckers in the stake and string system were pruned to leave two or more stems. The yields in pounds of No. 1 and No. 2 fruit per plant in the study were up to twice as high for the indeterminates Big Beef and Cherokee Purple in a stake and weave system compared to a stake and string system. The determinate Mountain Fresh also had a yield advantage with stake and weave, but the advantage was much smaller. The stake and weave system also had significantly less cull fruit, less farm market grade and less cracked fruit for Big Beef and Cherokee Purple, although the advantages were much less or insignificant for Mountain Fresh. However, the stake and string system – which was pruned – had larger No. 1 and No. 2 fruit for Big Beef and Mountain Fresh. There were no significant differences in the size of Cherokee Purple. “In prune and string, we saw a larger average fruit size,” Maynard said. “The system is a way to boost up your fruit size if you aren’t getting the size you want.” The stake and string system also had more potential early yield. “The take-home message of this is if even if you’re going early, there’s still an advantage to stake and weave,” Maynard said, “even though some say a string system is easier to prune, and easier to manage, because you can see the tomatoes. But it gets to be a very individual decision and determining what’s best for your farm.